I don’t even really know where the time goes. I still want to talk about February 17, but there is no time to do it justice. Lately, I can’t seem to get to bed before 2 a.m. I work until past midnight every night, usually closer to 1 a.m. By the time I make a school lunch and fold a load of laundry, it’s 2 a.m. I’m yawning right now. 1) I saw a roadrunner running across the road this afternoon while on the way to the YMCA. 2) My puppy is 5 months old now and needs both a bath and to be spayed. 3) My office is in constant danger of a being buried in a paper avalanche, even though I clean it regularly. 4) I still think about that time in college that some boy was telling me about his ideal woman. I said (foolishly), “Like me, only prettier?” And he said, “Yes.” That still hurts my feelings as ridiculous as it sounds. 5) My daughter misplaced her eyeglasses. I’m sure they’re in her cluttered room but I don’t have time to search. 6) I would like to eat pizza every day for the rest of my life. 7) My husband and I went to a very fancy movie theater the other night. Without even asking, the young man behind the cash register gave my husband a senior discount. 8) When bangs are in fashion, I do not have bangs. This applies to pretty much every fashion and body trend there is. 9) I don’t understand why I don’t ever hear from someone I used to hear from regularly. 10) My garage is still unorganized from our move last summer, but over the weekend I completely cleaned and organized my pantry. ← Sunday, where did you go? I will miss my grandmother till the day I die. She passed away in ’99. I wouldn’t know a roadrunner if I saw it. #6 – I am so with you on this one! It really is the perfect food. #8 – It’s easier to go from no bangs to bangs than the other way around. I seem to be in a pattern where I grow mine out till they drive me so crazy I get them cut, and then the cycle begins again…I never really know whether to have them or not. #7 amused me. At age 55, I experienced my first “senior citizen” discount at a restaurant. I was surprised, yet pleased at this, as the money saved adds up. But your husband is not even a little bit old – do hope he was amused rather than upset. #1 – I would love to see a roadrunner (and know that it was a roadrunner when I saw it!). I would also like to see an armadillo. A live armadillo (I’ve seen plenty of armadillo roadkill) in the “wild”. #2 – Hope the spay recovery goes well when it happens. I remember being up all night with my dog when she had it done oh so many years ago. And the next day I asked to go home early because I was worried about her. The good news – you work at home so you’ll be able to take care of your puppy without making your boss mad! #9 – A good friend from before we moved rarely talks to me any more. When we do talk (or email), it’s because I initiated it. I don’t know why this has happened but it makes me sad. #10 – My garage is also a mess from the move. I think I’m going to have to bite the bullet and spend some serious time finishing the unpacking and getting things organized. There are a few things I’d like to find again! 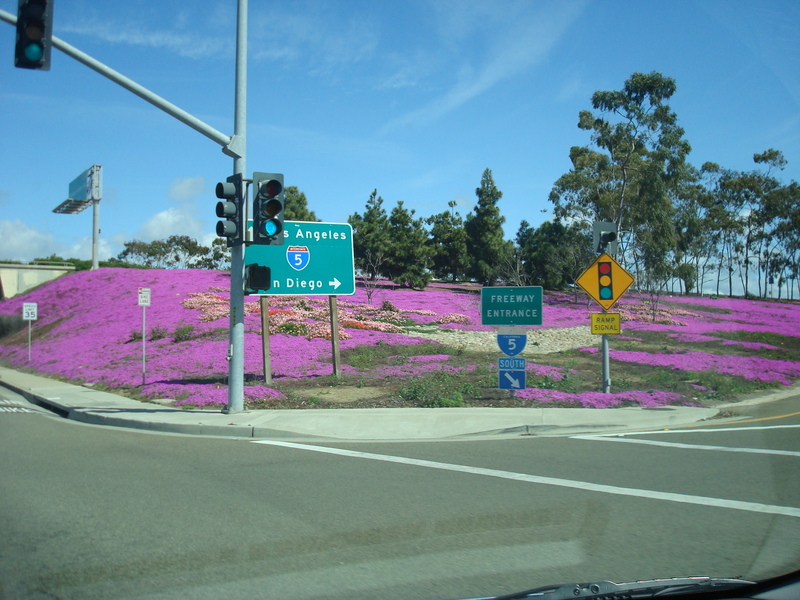 And my own random thought… don’t you just love the color of those flowers?! I love it but it is impossible to truly capture the color in a picture unfortunately. Ugh. I’m the one getting the senior discount. Steve, not yet. It wasn’t THAT long ago that he went to a movie with our oldest son and they BOTH got the student discount.